Sky’s see-through skinsuit: One marginal gain too many? Chris Froome has caused a Twitter stir this week by posting a photo of himself wearing what can best be described as a see-through Team Sky skinsuit. Apart from a ‘modesty panel’ at the front and rear of the shorts area, the Rapha-manufactured skinsuit appears to be made of an extremely lightweight material that means you can see the man beneath the clothing. We can say with some certainty that Froome does not have many tattoos or body piercings. 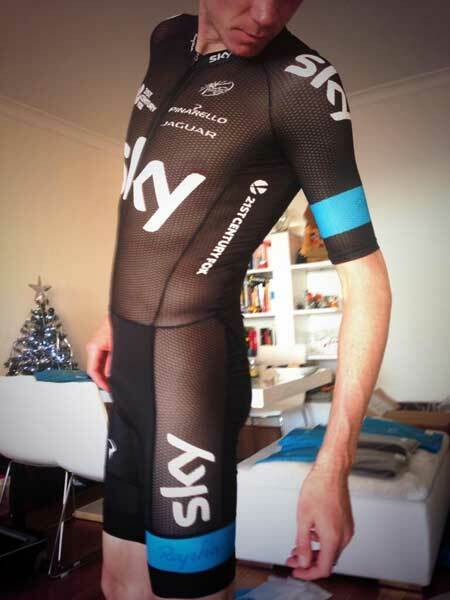 The skinsuit is part of Sky’s new 2014 kit range, which has now been dispatched to riders ready for the impending season start. Although we doubt that many British-based riders will be using the skinsuit for at least a few months on home soil. It doesn’t look like it has much in the way of thermal properties: more marginal losses than marginal gains in terms of thickness. Sky’s latest team kit is an evolution on last year’s design. The predominately black kit is highlighted with blue bands on the left leg and arm, with the addition of Sky sister company 21st Century Fox logos on the flanks and front right, and a Jaguar logo on the left. Last year’s kit is currently being sold off by Rapha at heavily discounted prices via its website. One question remains: has Rapha made a yellow version of the skinsuit for this year’s Tour de France?